So I am at CHA ... pictures to post tomorrow ... Grace and I had so much fun today and I can not wait to show you all the stuff I made and the new product that will be posted soon .I ordered a alot of the new releases and Reggie (the dearest husband) Has a to get done list and he promises that he will have it done. I met some really neat people today ... and their job at Stampendous is to play oh what a job they have .... oh wait I get to do that too LOL . You should see the Stampendous craft room and the set that they do all of their videos. I have some cute stuff coming your way tomorrow so stay tuned. I have blogged two days in a Row .... SEE I am better , we have been a bit slack on getting the new product up online though. I am Sorry I had Physio today and I was flat on my back most of the evening .... OUCH she really rips my shoulder up .... anyway now I cant sleep. I borrowed an idea for this card .... it was sent to me in an email from Stampendous but I had to do it .... HI HO silver looks the best on this card. Some of you have been asking what the difference between the colors are and HI HO silver is more if a true silver then Silver Bells . Silver Bells has a blue hue to it and its not as shinny. 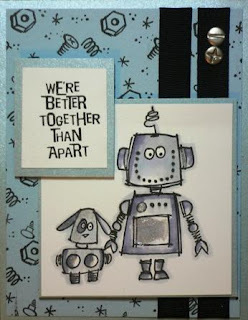 In this card I used the new Stampendous Sets the ROBOTZ and they are so cute you will have to check them out on my website they are available for purchase now and will ship the day you order them. Ok so the mailman came twice today he forgot to give me my other package ... I have to show you what some of the design team has been up to .... these girls are fantastic this is just a sampling of what I received in the mail. 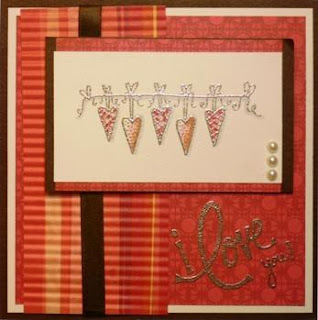 In this card Lindsay used the Floral Heart stamp and Dew Drops and those cute little stick pins I am going to have some soon they are a must have. Michelle did a wonderful job on this card ... I am sure it took forever there is so much detail in this stamp Called Heart Frame ...What a boring name for such a beautiful ornate stamp . Hey Everyone .... Its been awhile ... a long while . Most of you know that I had to move quickly after some plumbing issues one month ago. So now Reggie and I are settling in to our new home with the dogs. We are all very happy here . I have a huge craft room where as before I had to share the livingroom with my Husbands flat screen TV. (men listen to the TV way to loud)So now Reggie doesnt have to listen to the livingroom babes and we do not have to listen to the T.V. The dogs also have benifited from this move .... they now have a yard its HUGE and they love it every morning Stella opens the curtains in our bedroom around 6am and wines to go out. Reggie is by the door LOL. Christmas was wonderful this year ... My father came from Canada to see us and we had a nice quiet Christmas. I was very blessed to get a computer and the best paper cutter in the world THE ROTO-TRIM. A dear friend of mine has had hers for 15 years and she bought it used and has never replaced the blade. My husband swore after the last convention that I would have a paper cutter that would save me time and make it easier for me to get things done. Its amazing what happens after he has to cut paper at 3am .We calculated how much money that we spent on paper cutters in 5 months and it was awful so we upgraded . It was a lovely Christmas Surprize! Everything is in stock and ready to ship now you order today and we ship to you the next day .... We have a very fast turn around. 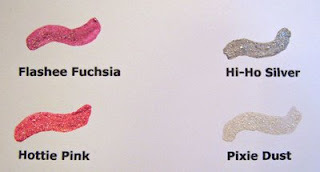 So for the next week give us a try .... we have Shimmerz on Sale for 3.24 and if you buy over 40.00 in product we are going to give you free shipping ... Just put in the code HNY2009. I guess I should get to bed I am going to be at OF THE HEART at 10am doing a free make it take it and its a very cute card and I am bringing a ton of card samples and Rubber stamps from The Rubber Cafe .... They are having a New Years Day party ...Hope to see you there .